Rumsey sets out on an ambitious book that reviews the history of the Library of Congress and asks how we remember, how it has changed and what influences our instant society plays in the process. In a world where people document their entire lives with digital photography, we seem to remember less and less about our lives. In a world with instant answers to any question on Google or Wikipedia, with more information than we’ve ever had access to, we somehow seem to know less and less. Though several researchers have investigated the link between instant images and our inability to remember details from our memories, Rumsey reviews distraction and technology-induced amnesia more than she provides any clear solutions moving forward. 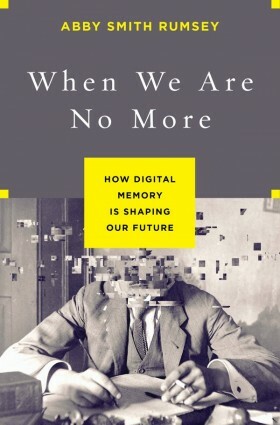 Her book, When We Are No More: How Digital Memory is Shaping Our Future, is exceptionally well written and thought-provoking yet leaves the reader wanting a bit more in terms of how to apply what she reviews in a meaningful way to protect themselves in a world of distraction. To quote Rumsey, we live in an “abundance of information and scarcity of human attention.” Her thorough review of why data storage is not memory, “why forgetting is the first step towards remembering” and why her book really talks about the future more than the past is an exciting read for anyone who is concerned that we are throwing all of our memories into a digital “black hole” might not be able to be deciphered 1,000 years from now.